It's definitely that time of year, where everone goes overboard with the pumpkin. Pumpkin spice lattes ((I'm definitely already over reading countless tweets & facebook statuses about everyone's beloved PSL. White Peppermint Mocha is where it's at, y'all)), pumpkin pie, pumpkin muffins ((check)), pumpkin bread, pumpkin macarons ((that's next for me! )), pumpkin soup ((no thank you)), you NAME it. I'm definitely a fan of this beloved orange squash. I've been wanting to make homemade marshmallows for a while, but because of the mess, the time, etc., I wanted to make it worthwhile and do something crazy with the flavor. Alas, the Pumpkin Spice Marshmallow was born. I combined about 4 recipes based off of ingredients I had and then made up the rest. What can I say? I was feeling ballsy bold. 1. Spray down your 9X13 with cooking spray, I used canola oil. Sift a spoonful of powdered sugar on top and make sure the sides and bottom of pan are covered. 2. In your kitchen-aid mixer, sprinkle the gelatin over your 1/4 cup COLD water and let it sit. This will make it soften. No need to stir yet. 3. In a saucepan, combine your sugar, corn syrup, another 1/4 cup of COLD water, and dash of salt over low heat. Stir with a wooden spoon or non-stick spoon-tula until the sugar has dissolved. Increase your heat at this point to medium/high. Bring mixture to a boil, hook on your candy thermometer to the saucepan and, without stirring, let boil until the candy thermometer reaches 240° F. This took about 6-8 minutes. 4. While the sugar & corn syrup mixture is boiling, take a handheld electric mixer & beat your egg white until stiff peaks just begin to hold. It should be white, but not super shiny. 5. Once your sugar & corn syrup mixture has reached 240° F, remove from the heat and pour over the gelatin mixture that is in our stand mixer. Stir gently until the gelatin has dissolved. Then, turn the mixer on high speed for about 5 minutes until it is thick and white. It should triple in volume. 6. Beat egg white, vanilla, torani syrup, pumpkin pie spice and pumpkin together JUST until combined (don't over-do it!) and then add it to the gelatin & marshmallow mixture in the stand mixer. Again, beat together until just combined. 7. Immediately pour mixture into your powdered 9X13. Mix a spoonful of powdered sugar and a dash of cinnamon and sift over marshmallows in pan. Let them chill in the refrigerator for a few hours. 8. When they're chilled and "set," spray a knife with cooking oil and run it along the edges of the pan. Cover a baking sheet with powdered sugar and flip the marshmallows onto the baking sheet, gently. 9. 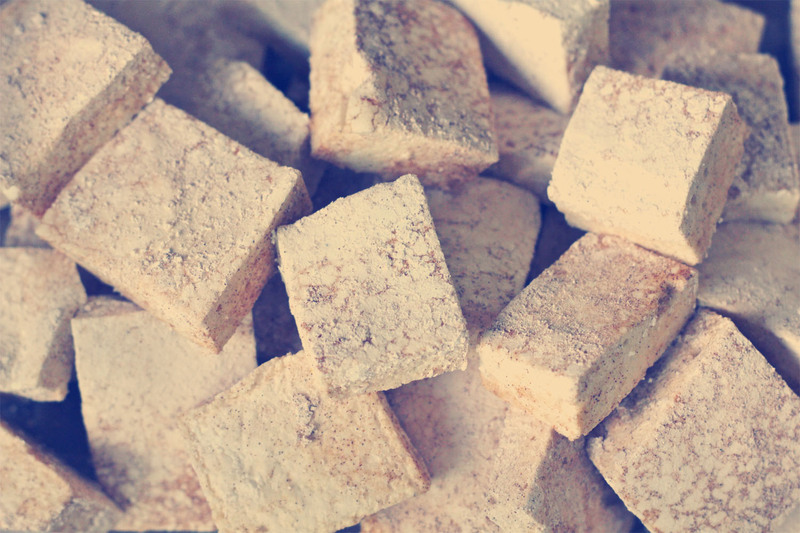 Cut marshmallows into cubes or desired shapes and cover all sides in a powdered sugar + cinnamon mixture. This ensures that they won't stick together once you package them. I plopped ((is that a gross word? whatever)) a few in a homemade vanilla chai latte and it was PERFECTION. Enjoy! 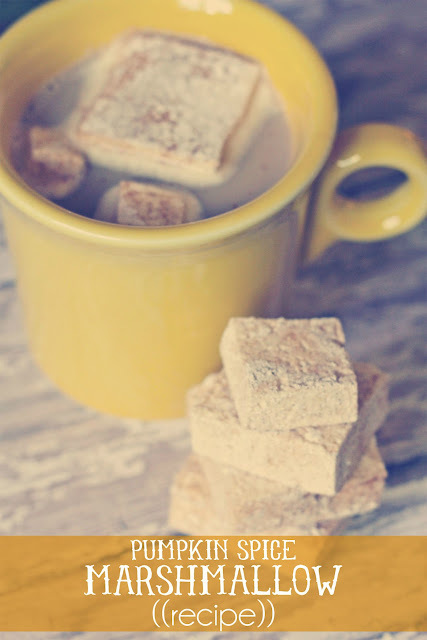 NOTE: THE VANILLA CHAI LATTE IS SIMPLY A VANILLA CHAI TEA BAG STEEPED IN MILK AND WATER. IT WAS THE STANDARD RECIPE ON THE BOX. HOPE THAT HELPS! These look so good! Can't wait to try this out! 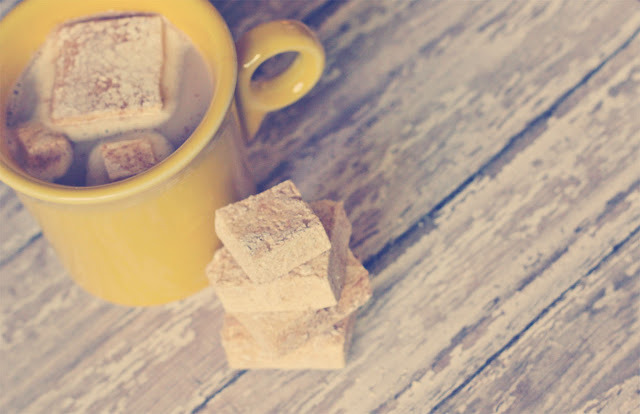 These sound delicious, especially in a spicy chai–yum! Do you have a recipe for your vanilla chai latte? Thanks! just a vanilla chai tea bag steeped with milk & water. Thanks so much for this recipe!!! I am so making some of these especially since Fall started TODAY!!! How long are these good for? Do you having storage tips/tricks? i'd keep them for up to a week or two. i just stored mine in an airtight tupperware container.